Johnny Sutton wasn’t the only figure featured in Topps’ notably drab 1979 series to receive a wadded-up handwritten message from the Two Freaks. Check the slight bulge—the exact size of a wadded-up page—in Phil Mankowski’s back pocket. Now check the troubled look on his face. While Johnny Sutton’s expression of 89% muted trepidation and 11% dim hope implies that the letter balled up in his glove was unread at the time of his photograph, the face of the player in the card shown here speaks of enigmatically haunting information freshly received. Phil Mankowski, who should be snarling with confidence, a young, promising player on a young, promising team, instead appears to be in the earliest stages of a comprehensive existential cringe, as if he has just been shown the few seasons of stats on the back of his baseball card in the context of a detailed timeline of the 4.54 billion year history of the planet. We don’t amount to much. Before we embark on our urgent message to you, please allow us to introduce ourselves. We were born and one day will die. In between those two points there has been disappointment, but not nearly enough of it. Oh to be so disappointed that all points are dispersed, disassembled, dissolved, linear narrative forever undone. There is no story! There is only Right Now! But until that day we live in a hierarchical age where everyone is enslaved by the linear story that goes “we were born and one day will die,” so to communicate we must temporarily conform and speak in those terms. We have been roaming the land for some years. Long ago, while taking our first awkward bony-kneed steps out of childhood, we were savagely beaten by a small informal collective of muscular peers from fractured, economically disadvantaged families. After that one of us developed a gift for silence, which was referred to by most as a stutter, while the other developed a gift for staying in the present, thought of by most as a damaged memory. At first we struggled with what we saw as our afflictions, seeing that they would make it difficult for us to live normal lives. At the same time, we kept our distance from one another, despite our history of being close childhood friends. We each saw the other as weak, a magnet for further victimization. Odd that we were brought together again by those supposed afflictions one day in the parking lot of our local military induction center. Instead of being shipped to a faraway land to kill and be killed, we were rejected for our afflictions. We laughed together in the parking lot, finally reunited, and wondered what to do with our ridiculous freedom. Roam the land, we decided. Roam the land and be as pointless as humanly possible, spread the garbled word as quietly as possible, so quietly it is only ever caught in a flicker, to seep past conscious thought, to be immune to memory, to exist only as a seed for dreams. We have been public figures with no publicity. We are the winners of the contest to see who can throw the softest punch. We are the sound of one hand clapping. We are the tree that falls in the forest with no one around to hear. Do we make a sound? The only way to know is to join us. This is our urgent request. In fact you already have joined us. Embrace your fate as one easily forgotten. Marginals of the World Unite! The epoch of chemically-aided hope that weirdness and wide open spaces might one day reign is nearing an end. The 1960s eructed Technicolor puke all over the 1970s but the puke has almost completely dried. It’s 1979. Everyone is depressed, divorced, precariously employed. What is the point of your meaningless flailing? There is no escape from this profound inconsequentiality. There is no escape from this brief gift. What to do with these entwined incarcerations. What to do in this life? We urge you, when next you are called upon to perform your duties, to refuse. Accompany the refusal with silence, or nod to our fictional forerunner, Bartleby, and say that you would prefer not to. We have contacted several just like you and implored them to do the same, to do nothing, to refuse. Think of the effect on the world! All us supposedly desperate ledge-clingers letting go of the ledge. Refusing to pinch-hit, refusing to mop up, refusing to act as a late-game defensive replacement in lopsided blowouts. If we marginals could all fall together the enslaving story that ends in death would be undone. When there is no up or down, falling becomes flying. Phil Mankowski did not, as far as I know, follow any of the garbled collective suggestions of the freak with the stutter or the freak with the faulty, clouded memory. He did, however, change upon the release of this card from a young, promising player with .275 career batting average (high for a third baseman of that era, especially compared to the anemic hitting totals produced by the aging Tigers regular at the position, Aurelio Rodriguez) into a prototypical major league marginal. After hitting .271, .276, and .275 in his first three seasons, Mankowski plummeted to .222 in 1979, causing the Tigers to paperclip him to a deal that sent journeyman Jerry Morales to the Mets for famed digger of graves Richie Hebner. 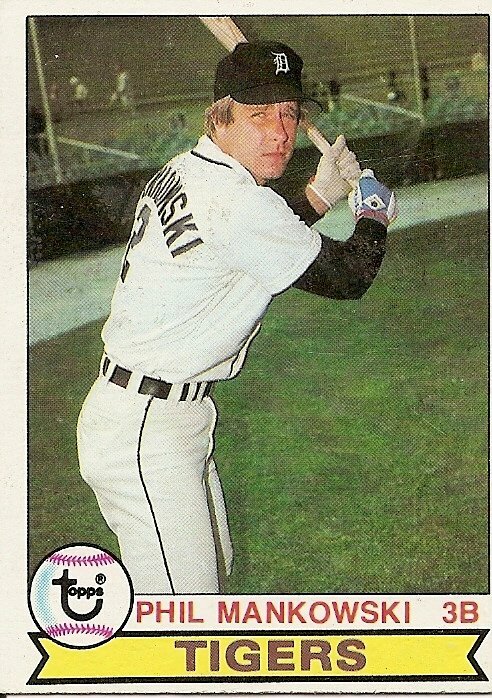 Mankowski hit .167 in 12 at-bats in 1980, didn’t play in the majors in 1981, and called it a career with a .229 mark in 35 at-bats in 1982. Never much of a power hitter, he had managed a respectable 8 home runs in 593 at-bats prior to appearing on a baseball card with the letter from the Two Freaks in his back pocket. He would never go deep again. 1. The image of Phil Mankowski being paper-clipped to Jerry Morales as part of the epic Richie Hebner deal was delightful and made me very happy, Josh. 2. Thank you for saying that, GatesFan. I appreciate it. If baseball history was written as a bible, my favorite book would probably be The Book of Transactions. 3. With his expression he appears to be saying “I’m not wearing a helmet, please don’t throw at my head. I’m not even standing in the batter’s box”. This card made me realize how retiring uniform numbers must be a relatively modern phenomenon. Mankowski is wearing #2… and up until today I would have thought that number would have been retired since the Korean War era in honor of Charlie Gehringer… one the best second basemen to ever play. But alas, the Tigers didn’t get around to retiring Gehringer’s #2 or Greenberg’s #5 until 1983.